Pre-cooking rice is not so much about how to cook the rice, but how to store it. You follow the same cooking instructions as you would for immediate consumption, making sure to cook the rice to a fluffy texture and avoid a gummy outcome. Once the rice is cooked, store it properly so it's ready to use in dishes. You can add pre-cooked rice at the end of the cooking time for most dishes calling for rice. It also works well in fried rice or served plain as a side dish. 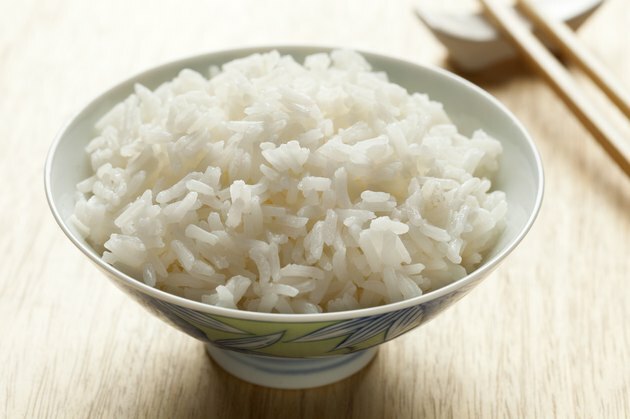 Rinse the rice a few times under cold, running water to remove the loose starch so that the rice is less sticky. Drain the rice in a sieve until all of the water is completely drained. Place the rice in the saucepan with the amount of water recommended on the rice packaging. Add salt and butter or margarine if you wish, based on the amounts recommended on the rice packaging. Place the saucepan on a stove-top burner set to medium-high heat. Bring the mixture to a boil. Turn the heat down to low to simmer. Cover the saucepan with its lid. Simmer the mixture until the water is completely absorbed and the rice is fluffy. This make take as little as 12 minutes or as much as one hour. Base the simmering time on the directions provided on the rice packaging. Remove the saucepan from the heat and let the rice sit for a few minutes. Transfer the hot rice immediately to a resealable bag or covered container to lock in the moisture for storage. Store the rice in the freezer or refrigerator. Cooked rice keeps about six days in the refrigerator or up to six months in the freezer. Store the rice in 1- or 2-cup serving sizes for convenience. Heat the pre-cooked rice in the microwave or on the stove top over low heat; add 2 tbsp. of water per 1 cup of rice before reheating it.